With warmer weather finally upon us, it is natural to think about changing our diet to be in harmony with the new season. This is a natural change that both our mind and body desires. Do you ever wonder why you crave salads all summer long and warm comfort food in the winter? Our bodies are influenced by the different climates and for optimal health we should live in congruency with those changing seasons. Seasonal eating means eating foods that are available and locally grown. Cleansing or fasting can be done in this season. Just like cleaning and purging those closets, your body is ready for purging. Chlorophyll rich green foods are great cleansers. Consume an abundance of leafy greens including beet tops, swiss chard, kale and collards. Add herbs such as parsley, dill and cilantro to meals. Increase your consumption of fresh fruits and vegetables, sprouted seeds and beans. A lighter fresh diet, high in water foods, is required in hotter weather. Continue with the local fruits and vegetables, including the abundance of local berries available. Include juicy fruits such as melons and citrus with high water content in your diet (may not all be local but find the ones that have travelled the shortest distance). Decrease cooked foods and increase raw salads. Decrease heavy proteins and fats and incorporate more fish and lighter oils. Iced herbal teas infused with berries, citrus or cucumbers will help you consume more water. As weather cools our bodies require more cooked foods and slightly heavier proteins and fats. Harder fruits such as apples and pears should be consumed along with root vegetables. Other harvest foods would include whole grains, raw seeds and nuts. In the colder temperatures we often need more fuel to generate more energy. This comes in the form of richer, denser foods. A little weight gain may even be normal during these months. Our bodies require complex carbohydrate from whole grains, squashes, potatoes, sweet potatoes and root vegetables. Meat and poultry are usually consumed more as crock pots, stews and soups are made. Seasonal eating not only fuels your body but nourishes your mind, energy and spirit. It provides the right type of fuel as our cyclical rhythm and needs change. Embrace the new season with a trip to a local Farmers Market or start planting your own garden for an abundance of fresh, local vegetables throughout the spring, summer and fall! My name is Charles Curtis, founder and President of Curtis Health. For more than 30 years I have been reading, consulting, discussing and writing on the ever increasing costs of poor health in the workplace and improving workplace well-being. 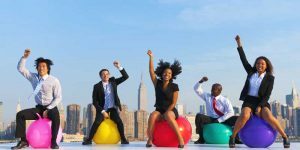 We know that costs associated with employee health continue to rise regardless of the overwhelming evidence of the positive return on investment (ROI) from effective workplace wellness programs. So how can we determine what programs result in the positive outcome companies now must strive for? Leadership by example from senior and middle management creates a healthy culture. Policies and practices that reflect a culture of health and a commitment to a healthy workplace. Communication is critical. Employees must understand the employer’s commitment to employee health and wellness offering. Targeted programs to identify top health risks. Evaluate outcomes for analysis and benchmarks. Over the past 30 years, some organizations I’ve worked with exist through a philosophy of wellness for everything they do. Starting from the top, leadership believed that organized wellness activities were to be woven into the fabric of the company. The result was continuous growth, positive energy, pride and better outcomes resulting in organization wide cost savings while allowing the wellness budget to continually grow. Contrary to this winning approach, I have seen cases where a very small budget was given to outfit fitness centres and see how the attendance would be before any more funds were injected into the program. This “build it and they will come” philosophy without strong leadership or investment usually results in little engagement, accountability and ownership of the program. Simply put, a fitness centre, the odd education communication, a weekly class and workshops as a “wellness program” does not result in positive changes in the workplace. A strong business case with solid policies and practices is a must in order to sustain a wellness program over time. The strongest programs have a team of dedicated employees supported by leadership and an outside expert to help guide them through the pitfalls of a start up or refresh. Forming a committee to establish guidelines sets the tone for a strong program. The key to this is having a solid plan and committee members that are committed to the program, the company and the people. Without a dedicated group willing to work hard and support the policies it is an uphill battle. The best programs have the strongest methods of communications. If the communication system is not effective then it doesn’t matter if you have the greatest programs available. One example of this I have seen, had a middle management who believed in the program but there was little budget to promote the services. That created a situation where the organization had little “skin in the game” and left the program and sign ups to the employees without financial support, leadership or ownership. That was not a sustainable model. Opposite to that, I have seen programs that have a strong web presence, communication policy and plans. Consistent messages and programs are promoted well in advance throughout the locations and levels of organization, and supported by champions spreading the good word. Again, the more the investment and programs are communicated effectively, the better the returns. Using passive forms of communication alone, such as educational handouts on fitness, health and wellness, does not achieve a positive return on investment. Behavioral health interventions will provide a much better result, establishing a winning plan for reducing those costly areas of concern and enabling the employee population of your company to flourish. In my experience, using a health risk identification process and interest survey as a program launching point will ensure all data and health trends are collected from the beginning. This data is paramount in identifying and targeting the key areas of risk and interest in order to establish the most effective services and programs and maintain program accountability. As a follow up to the risk identification process, it is suggested organizations develop a comparative feedback measurement to evaluate program success and establish accountability. The most successful programs are under constant scrutiny and evaluation. Evaluation can come in many forms: participation levels, participation feedback, pre and post test results and financial cost benefits just to name a few. This process motivates the organization to keep on top of the program and make adjustments as needed in a timely matter. Charles Curtis is President of Curtis Personalized Health Management and owner and General Manager of 12 Weeks to Wellness: Premier services in providing fitness, health, wellness and coaching programs to individuals and organizations since 1985. Visit us at any of the following locations! Wright D.W., Schultz A, Edington D.W. Journal of Health and Productivity 5(1):3-9, 2010. 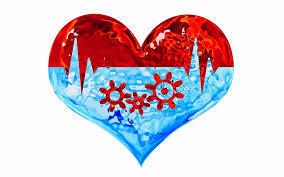 Good Cardiovascular health requires good circulation as blood carries oxygen and other essential nutrients to the body cells while removing cellular waste and toxins. In order to effectively do this your blood vessels, need to be strong, flexible (relax and contract) and free of blocking debris. Cholesterol often gets blamed for poor CV health however recent research is finding that inflammation and diets high in refined carbohydrates and sugars are major contributing factors to poor CV health. The production of vitamin D from UVB sun rays. Lipoproteins carry cholesterol through the blood stream. Low density lipoproteins (LDL) carry cholesterol from the liver to the blood stream while high density lipoproteins (HDL) moves cholesterol from the blood stream back to the liver. LDL particles, which are often referred to as ‘bad cholesterol’, come in two sizes, large and small. It is the small dense LDL that are most damaging if left in the arteries and can contribute to arterial disease. Balance of the HDL and LDL is important to limit any buildup of blood cholesterol in the blood stream. This positive change from exercise is not permanent though and therefore exercise must be repeated on a regular basis. The frequency and duration of exercise is more important than intensity when it comes to balancing cholesterol levels. Consume high fibre foods, found in vegetables, fruit, legumes and whole grains. Fibre can act like a sponge and remove cholesterol from the gut. Eat Vitamin C foods (berries, cantaloupe, kiwi, mangos) as vitamin C decreases LDL and increases the strength and compliance of blood vessels. Ensure good gut flora. Healthy microbiomes assist in decreasing LDL levels. Eating fermented foods such as sauerkraut, kimchi, kombucha can support healthy gut flora. Consume copious amounts of garlic, onions, celery, raw walnuts and almonds. These foods decrease LDL and triglycerides and increase HDL. Reduce the intake of refined carbohydrates and sugars. These foods increase blood sugar levels and contribute to the liver converting the extra blood glucose to cholesterol and triglycerides. They also contribute to overall inflammation in the body. Avoid all trans fats – hydrogenated and partially hydrogenated fats. These are found in most processed foods. Replace coffee with green tea as green tea decreases LDL. Green tea does still contain some caffeine so be cautious of intake. Consume moderate amounts of healthy fats such as olive oil, avocado oil, sesame oil and grapeseed oil. Avoid processed foods as they are high in refined carbohydrates, sugar and unhealthy fats. All of which contribute to high LDL levels. Stress hormones increase blood glucose levels and therefore contribute to inflammation and increased LDL and triglycerides. Managing stress can have a direct effect on decreasing LDL levels. 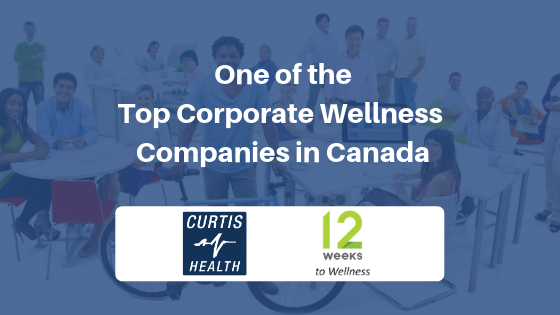 Curtis Health, a Vancouver-based workplace health and wellness provider, has been named one of Canada’s top wellness companies by CoreHealth Technologies, a wellness technology vendor. “As a leader in individual and Corporate Health and Wellness since 1985, we have built a foundation of creative programming, unprecedented service and proven, effective health promotion and wellness solutions. These services include a full scope of individual and corporate fitness, health and wellness services, fitness facility management, space planning and operations,” says President, Charles Curtis. Curtis Health, and its partner 12 Weeks to Wellness, provide shared wellness and health coaching services to a variety of industries and organizations including technology, gaming, government, utilities, manufacturing and transportation as well as Employee Assistance Providers and property development / business park fitness facility management. Curtis Health currently provides these corporate health and wellness services to over 12 companies and multiple properties, office towers business parks onsite, encompassing more than 28 fitness centers. “We are very proud of our accomplishments and how effective we are in making a positive, notable difference in the well-being and health or our clients and their employees. We are committed to evolving our workplace wellness programs to meet the unique needs of each of our clients,” says Curtis. It’s January, the time of year when people start asking you, “So, what are your resolutions for 2019?”. Ugggg! You know the statistics; By the 2nd week in January most resolutions have been broken, by February the gym is quiet again and by March most people can’t even remember what their resolutions were. January can be a great time to reflect on what’s important to you, and where you would like to make some changes. It should be a positive experience with enthusiasm for the outcome. Goal setting is about aiming for success, not setting yourself up for failure. Specific – Be specific, goals should be clear and distinct. Write them down. Measurable – How will you know when you have been successful? What is the criteria? Attainable /achievable – Set yourself up for success. Be realistic with what you can achieve. Realistic and relevant to you and your life. Are you able to commit to the goal? Timely or time based – Each goal should have a completion date or timeline. Remember SMALL changes can make HUGE differences. Give the goal(s) some thought. Is it really important to you? How will it make a difference in your life? Write it down and then edit it. If you are eliminating something from your diet or lifestyle, what healthier choice could you replace it with? If you are starting something new where do you see it fitting into your schedule? Should you hire a professional in that field to support and guide you? When do you expect to feel/see the benefits? Can you afford it? Can you afford not to do it? Making S.M.A.R.T. 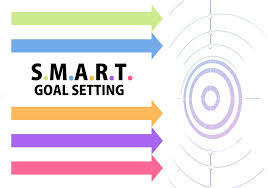 goals adds motivation, gives you direction, organization and a timeline. Set yourself up for success in 2019!! Happy planning and remember the Curtis Health Team is here to assist you. Be accountable to a Curtis Health Team member and we will cheer you on! September is often like the autumn version of the New Year’s Resolution. It’s the inevitable time during the year where our minds need a pep talk in order to get back into a routine; back to work normal hours, get the kids back in the rhythm of school again, and to get back into a routine at the gym. We get it, summer is a difficult time of year to keep a routine going. The lake, beach, hiking, camping, fishing, beers on the patio, road trips. 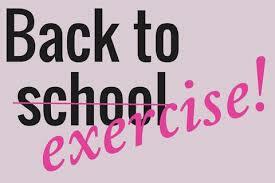 But now that it’s back-to-school time (yikes!) here are some tips to help you get back into your best fitness routine! If you make a commitment to go to the gym on a specific and regular schedule, for a specific amount of time, you take the pressure off yourself to decide daily if you should go. For example, commit to going for a workout 3 times a week until November. Be vocal about it, tell everyone, add it into your schedule and post it. You’ve now made your commitment and you’ve now made yourself accountable. It’s always more fun to work out with a buddy! Having accountability of a friend and the social support of a good habit makes it more likely to stick. Schedule your workouts in advance. Lay your gear out the night before and plan your meals ahead of time. Success is simple when you plan ahead. If you know your gym time is at 5pm, your gym bag is already in the car when you get off work, and dinner is in the slow cooker, life is easier! If you know you’ll put it off, plan ahead to get up in the morning for a quick 30 minute workout before your work day. If you don’t enjoying going to the gym, it’s going to be harder to get back on track. Do something you enjoy doing. There are so many different ways to move our bodies, and to have fun doing it! Join a challenge, set a goal or reward or find just an moving activity that you’d enjoy to get you started back. When we’ve been away from the gym for a time, whether it’s a week or over a month, we aren’t usually at our strongest or fastest when we first get back at it. So be realistic with your expectations of yourself. Don’t beat yourself up if you’re not still where you hoped you’d be –it’ll come back with getting into a regular routine again. Just a few tips to help you get started. Happy September! Holism: in medicine- care of the entire patient in all aspects of well being, including physical, psychological and social. A holistic nutritionist works through preventitive and proactive health care through natural nutrition. 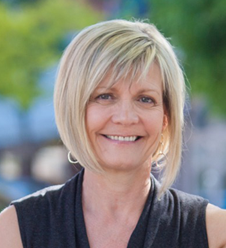 Hi, my name is Nancy Coles and I am a Holistic Nutritionist as well as a personal trainer. I have been in Health and Fitness for over 25 years. 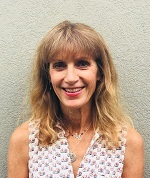 As a holistic nutritionist I assist you in achieving your goals and reaching optimal health and balance through a positive transormation that is suitable for you and your lifestyle. Do you suffer from digestive or intestinal issues? Blood sugar balance, skin problems, poor energy levels or sleep problems? Are you looking for sports performance improvement through a healthier diet? Or do you wish to lose some body fat? Whatever your goals or issues I would love to assist you in reaching your goals and finding a healthier you. ‘Natural nutrients’: Natural, alive, good quality. Good Quality: grown in soil rich in essential nutrients such as organically grown foods (pesticide free and without synthetic fertilizers). Grass fed meats, organic poultry, wild fish, organic free run eggs etc. Lifestyle: sleep, stress coping mechanisms, hobbies, family life, exercise, eating patterns, vacations, toxins, alcohol, drugs. Body/Mind/Spirit: Balance, baggage, chakras, self care, self worth, connection between imbalances and emotional issues. Below is a review of the Carrot Rewards App from our very own Laurie B.
Laurie is a Fitness Professional, not a millenial and self proclaimed “technologically challenged” person. She “gets” this app, you will too…. This is a FREE healthy lifestyle website and/or APP made in conjunction with the Province of B.C. You register and choose the partner you want to earn points with, such as your SCENE card toward free movies. You get a nice welcome bonus and then 10 or more points per play. Short, informative questionnaires are available to answer every few days that teach you about nutrition, activity and other healthy topics. Although I am a Personal Trainer I have learned a few interesting facts and I can see the level of knowledge expected from the general public. I have not tried the STEP feature, but one is available, and they offer prizes and challenges. Recommended for general engagement in a healthy lifestyle. Download in Apple or Google Play Store.